There is a sad phenomenon in this world. Regardless of the reason, certain people either suddenly or gradually develop a need to find out what is really going on. Research begins, questions are asked, notes are taken. Injustices are revealed. Cover ups are uncovered. Violations of rights and freedoms are discovered. This intrepid fact finder digs up the society’s dirty little secrets. Yet, for some reason, society is less than pleased. The problem is that 95 percent of the information out there is crap. If you want to find the truth, you’ve got to wade out into it. 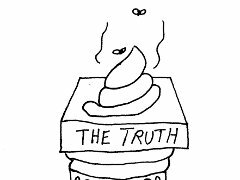 Worse, the truth has spent so much time buried in crap it looks and smells like crap itself. To be sure that this lump of crap isn’t the truth in disguise, you’ve got to take a real good whiff. But those interested in finding the truth do this because they must, which is admirable… until viewed from the outside. The rest of society looks at the man waist deep in the cesspool, digging with both hands, and they see a lunatic. With good reason, perhaps. Clearly this is not something a sane person would do. Meanwhile, all of the people in their right minds are sitting at the edge of the same pool, happy to deal with the first crap they find, simply because it is easier and, lets face it, everyone else is doing it. Things go downhill from there, too. Let’s say you find yourself a nugget of truth. You are excited, and why wouldn’t you be? All of your hard work has paid off! So you excitedly rush to the nearest edge sitter to show off your find. Suddenly your fortunate confidant has a feces-encrusted maniac shoving a turd-smeared truth in his face. Strangely, gratitude is not the first reaction. Instead you frequently get, at best, patiently humored or, at worst, angrily silenced. Why is this? Why don’t people want to know the truth even if you are willing to spoon feed it to them? As near as I can figure, there are a few reasons. First, activism is like surgery. There are times when it is helpful, or even essential. However, it is best left to trained professionals, and I don’t care how good you are, I don’t want it happening at the dinner table every night. Activism is second only to religion when it comes to making people uncomfortable. It all comes down to the fact that ignorance is bliss. Truth seldom comes as a friend, particularly truth you have to dig for. The facts dredged up from the depths tend to take the forms of great evils committed or vicious lies told by the sinister “they.” Not only are these new morsels of wisdom information we would have been happier not knowing, but they usually require action to correct, and people are (tactfully) comfortable, (frankly) complacent, and (bluntly) lazy. Telling them now requires them to up-heave themselves and do something distasteful, like protest, or else ignore the inconvenient truth and feel guilty. Thus, seeing a truth seeker rushing your way with his latest pooey prize is seldom a time for broad smiles and open arms. The real question is, who is right? Is the activist doing a public good by destroying the carefully designed distractions that keep the populous thinking everything is okay? Or do the people have the right to be deluded if they want to be? Is there such a thing as a right to ignorance? Well, in the words of Calvin, I don’t know and I refuse to find out. If you want to be an activist, activate all you want. Just respect the inactive from time to time.